Another good SEO tool (to increase the searchability of your website on the internet) is to set up a Facebook page for your business. You will need a personal Facebook account first in order to do this. Your Page name can be your business name or another name that people may search for to find your business. Use the About section to tell people a little bit about what your business does. Choose photos that represent your business well. You can use your logo as your profile photo and an image of your shop, products or one from a current marketing campaign as your cover photo. At the top of your Page you can add a call to action that directs your Page visitors to do something, such as visit your website or phone your shop. Adding a call-to-action button is as easy as a few clicks. It is a good idea to add a link here to your website. Also to put in your phone number and the hours that your business is open. There will be a small increase in hits on your website in our experience. But this extra activity will help your business get noticed online and drive more enquiries to you. Using a combination of Facebook, Google+ and Instagram to promote your business is a good way to get your business noticed online. How does it work once I have set up the Business page? Once you have set up your Facebook business page you will have access to administer it from your personal Facebook page. It will sit in the right hand panel at the top. Or in the drop down menu on your phone there will be a choice to go to your personal page or your business page. Once you have set up your Facebook business page and got it looking good, invite your friends to like the page. Facebook should offer this as an option when you switch to your Facebook business page from your personal fb page. You can promote the posts you put on to your business Facebook page. The cost is very reasonable, starting from $7 for an ad. We have had some resonable results from Australia wide promotions. 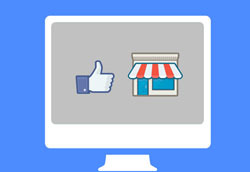 Comprehensive instructions and links on how to set up your Facebook business page can be found here. Check out the Rangs Facebook page here. If you need help with any of this or need to know more please contact us.